Construction on the second unit of Taishan NPP Phase I started in April 2010. Image courtesy of TNPJVC. COSCO Logistics delivered the steam generators at the Taishan project site in April 2012. Image courtesy of COSCO Logistics. Sir Robert McAlpine was awarded the design contract for two auxiliary buildings of Phase I of the Taishan NPP. Image courtesy of Sir Robert McAlpine. The financing co-operation agreement for phase I of Taishan NPP was signed in December 2009. Image courtesy of TNPJVC. Taishan Nuclear Power Station is expected to be the world’s largest nuclear power plant when it starts commercial operations in December 2013. 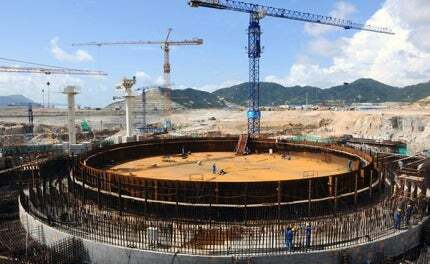 With an installed capacity of 1,750MW per unit, the nuclear power plant (NPP) is being built in a Chinese town called Chixi in Taishan City, Guangdong province. It is located approximately 130km from the city centre of Hong Kong. The project is being executed by Taishan Nuclear Power Joint Venture Co (TNPJVC), a joint venture between China Guangdong Nuclear Power Holding Corporation (CGNPC – 70%) and Électricité de France (EDF – 30%). CGNPC is one of the three state-owned companies authorised to establish nuclear power plants in China. The Chinese nuclear project is benefiting from the experience gained from the Finnish and French NPPs, with significant savings in cost and construction time. The first phase of Taishan NPP is expected to start commercial operations by the end of 2013. The first fuel assemblies for the plant were completed in March 2013. Taishan Nuclear Power Station is expected to be the world’s largest nuclear power plant when it starts commercial operations. The Taishan NPP will include a total of four reactors and six power generating units. It is being built over two phases with phase one consisting of two nuclear reactors with a capacity of 1,750MW each. Each unit will take approximately 52 months to construct. Units 1 and 2 are expected to be commercially operational by December 2013 and October 2014 respectively. TNPJVC is responsible for the financing, construction, operation, management and nuclear safety of Phase I of the project. The Taishan plant will use pressurised water reactors built from third-generation European technology. The reactors will be supplied by a consortium led by French company AREVA. Partners in the consortium include two subsidiaries of CGNPC, namely China Nuclear Power Engineering Company (CNPEC) and China Nuclear Power Design Company (CNPDC). AREVA will also supply the nuclear fuel and associated services for 15 years as part of the contract. Taishan NPP will be the first in China to use European Pressurised Reactor (EPR) technology. It will also be the third EPR plant in the world, after the Olkiluoto 3 NPP in Finland and French Flamanville NPP in Normandy, France. EPR technology boasts an easy-to-build and cost-efficient design compared to second-generation reactors. Safety and fuel efficiency is also higher in EPR plants. The EPR reactor for Taishan is designed based on the one being constructed at Flamanville NPP in Normandy, France. The reactor consists of four identical loops, each constituting a steam generator, a pump and the associated pipes, connected to the pressure vessel. The reactor units will be erected on raft foundation. Construction on Taishan NPP Unit 1 began in October 2009 and that of Unit 2 in April 2010. China State Construction Engineering Corporation is responsible for the construction of Unit 2. Construction on Phase II of the Taishan NPP was scheduled to begin in the third quarter of 2013 but is expected to be delayed. AREVA delivered the first two steam generators and the pressuriser for the primary reactor coolant system of the plant, in April 2012. The components were manufactured at AREVA’s Chalon-St Marcel plant. COSCO Logistics shipped the equipment by sea from the port of Fos, France. The first of the four HP heaters of the first unit was erected in June 2012. Two low pressure heaters were installed in October 2012. The installation of all the heavy components, including the reactor vessel, four steam generators and the pressuriser, was completed as of January 2013. Construction on Phase II of the Taishan NPP was scheduled to begin in the third quarter of 2013 but is expected to be delayed. The second phase will involve construction of two more units, 3 and 4, the major components of which will be built in China. The output of the Taishan nuclear station will be fed to the south power grid. Phase I of the Taishan NPP is estimated to cost CNY50.2bn ($8bn, approximately), which is being financed by China Development Bank (CDB), Bank of China (BOC), and Société Générale. CDB and BOC have approved a loan of CNY40.8bn ($6.5bn, approximately) towards the project. CGNPC awarded the engineering and procurement contract for the Taishan nuclear project to Alstom, in July 2008. The contract was worth more than €200m. China’s Lingao plant is located in Shenzhen, Guangdong. A consortium of Alstom and Dongfang Electric Company had also won a €300m worth contract for the supply of two turbine generators for the Taishan nuclear project in February 2008. The consortium will supply ArabelleTM turbine generator packages which include steam turbine, generator, condenser, moisture separator reheaters and steam to power conversion equipment. Sir Robert McAlpine has designed two auxiliary buildings of the plant under a contract that was awarded by AREVA in May 2009. AREVA subcontracted EGIS Industries for the design of civil works for the first two units of the plant. Sany has supplied crawler crane for the plant’s construction. Vinci Construction is providing technical assistance in the construction. The reactor pressure vessel was manufactured by Mitsubishi Heavy Industries (MHI). MHI delivered the vessel to AREVA in February 2012. The internal parts for the EPR nuclear reactors are being manufactured by ŠKODA JS, under a subcontract with AREVA that was signed in July 2009. The heat exchangers for phase I are supplied by DCNS, under a contract awarded by CNPEC in 2008. Baosteel was contracted by Dongfang in August 2010 to supply 510t of high value-added steel plates for manufacturing the turbine generators. ABB Xiamen Switchgear Company and ABB Xiamen Low Voltage Equipment Company are involved in the design and supply of the switchgears and circuit breakers for the plant. Seven Trent Services will supply its Capital Controls® chlorine dioxide generator for the water purification system of the plant. The chlorine dioxide generator helps to avoid algae and slime growth in the cooling system. The Taishan clean energy project is expected to save 10.5 million tons (mt) of coal burning, which will result in reduction of 22.7mt of greenhouse gas emissions per annum. The use of third generation EPR technology also enhances the safety of the plant. China has an ambitious target for the development of nuclear power projects in the republic. China has an ambitious target for the development of nuclear power projects in the republic. The nuclear power programme of China aims at having more than 100 reactors in operation by 2020, which will increase nuclear contribution to six percent of the overall power generation in the country. China further aims to increase the same to 16% by 2030, which is expected to be at least double the nuclear capacity of the USA. According to the National Nuclear Power Middle and Long Term Development Plan (2005-2020), China will have 40GW installed capacity in nuclear power operations with a further 18GW under construction. The target was even anticipated to be overachieved with 80GW in operation and 50GW under construction, but the Fukushima accident in Japan caused China to slow down on nuclear power projects and rethink about safety. China had 12,538MW of installed nuclear power capacity with a total of 15 units, as of May 2012.